1. Let YOU be MO Hawks center! Grow your studies. Build models of span of about 6 ft and get them to glide safely. Consider R-C of same. 2. Get in good physical shape. 4. Be watchful for YOUR niche interests. Consider study of YOU and http://www.energykitesystems.net/HGAusa/nicheHGA.html Vanilla hang gliding is just one of hundreds of niche activities of value. 5. Read Birdflight by Otto Lilienthal either free online or http://www.energykitesystems.net/Birdflight/ or both. 6. Study wind, gusts, and Paul MacCready guidance. 8. Study history of hang gliding. 9. Build a safe-at-stumble flatland wing for wing running. Do safe wing running. Explore your body, senses, airspeed sense (guess and check hundreds of times). At stumble, totally pre-arrange that you will avoid ground gouging or swing-through (that is, avoid broken tissues). No whacks! 10. Helmet and goggles and airspeed meter. But train your sense of airspeed without meter (but check yourself with meter). 11. Fly kites at many sites in many different conditions. Study wind with the kite. Find rotors with kites at some sites. Explore and map your environment for slopes. Measure and know the incline of slopes at sites in your reach. Have fun doing all such. 12. Form checklists and fulfill them gradually as needed. Water, safety, hygiene, risk management. 13. Instructors might move you faster than is good for you. There is much you can do to prep for eventual instruction. Know that you are a MO Hawk, Jeff, if such be your choice! Jeff1979 wrote: No luck with Bing. I PM'ed Free and Joe F.
Does MO HAwks still exist? The club President is Warren (Free), and I haven't seen a post from him in a while. I sent him an email message last month, and I'll follow up again with a copy to you. Maybe Jeff will BE the Mo Hawks!! Jeff, you've probably stumbled across this forum hoping to connect with local hang glider pilots. I'm sorry that we don't have very many to offer at this time. Maybe we can help you turn the Mo Hawks into a more active club. What do you say? Jeff, my last post in my own forum was September 2012? Jeff, have you spoken with Jim (Blindrodie) Gaar about flying in the Kansas City area? Isn't there a group with a tug, east of St. Louis? It's 250 miles across Missouri and there isn't much after you get here. I have been interested in hang gliding for some time now and would like to connect with others near by and perhaps meetup on a weekend with a group. Two ways to look at the situation. Back in the day if someone didn't pester me for lessons or information their fire for hang gliding wouldn't be enough to follow through. As for Al Hernandez of TX we all were just too far in miles away to provide enough fuel to keep a big fire burning. With less special observers that all by itself could finish the sport through attrition. less special observers that all by itself could finish the sport through attrition. Special observers could catch potential hang glider pilots by showing them what hang gliding offers before they are pulled into a metropolitan U$hPA school where they will be told paragliding is safer, better and quicker to learn -- and then sold a paraglider! I'm not sure how the Special Observer appointment differed from just regular Observer. The regular Observer appointment is not very effective/helpful for H1 and H2. As a Basic instructor I can work with H1 and H2. I'm writing because the long-time hang gliding pilot who started the "Mo Hawks" is back on line after a long absence. 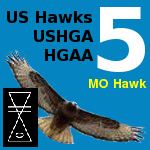 If you're still interested in hang gliding, please revisit the Mo Hawks club on the US Hawks forum (ushawks.org), and join in the discussion. I apologize for the long lapses in that club's activity, and I'm hopeful that someone like yourself might help spark a renewed interest in getting the club going. I hope Jeff is still around and still interested in the sport. One of the big functions of local clubs is to help mentor potential new pilots like Jeff safely into the sport. The RGSA has been doing that well for decades, and it's a model I hope all clubs can follow.